Topped with avocado slices, a good squeeze of lime, a sprinkling of cheese, some cilantro leaves and a handful of tortilla chips, this soup is sure to please your taste buds! 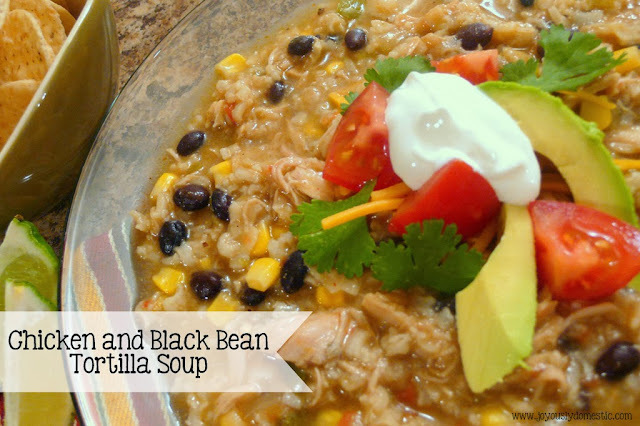 The addition of black beans, rice and corn make for a hearty, comforting version of chicken tortilla soup. And, the leftovers the next day are even better! Heat olive oil in a large soup pot over medium-high heat. Sauté the onions and peppers for 1 - 2 minutes. Sprinkle in the cumin, chili powder, oregano, red pepper flakes, garlic powder, salt and pepper. Stir to coat veggies. Stir in the canned green chilies and Rotel. Add in the zest and juice of 1 lime. Add in the cooked chicken. Stir to combine. Then, pour in the chicken stock. Bring to a light simmer. Add in the white rice. Allow to simmer for about 10 minutes. Then, add in the black beans and corn. Allow to simmer for 30 minutes. Taste and adjust seasoning ... you may find that you'd like more salt, pepper, cumin or lime. Cut corn tortillas into strips and add to soup. Shut burner off and allow soup to sit for about 10 minutes. Serve in bowls with toppings of your choice ... avocado, shredded cheese, diced onions or scallions and/or cilantro leaves. Serve with lime wedges for squeezing atop soup and tortilla chips for dipping or crushing into soup. Top with some sour cream. Enjoy! I adore Chx Tor Soup and look forward to trying this version. I have never made it ... only had it at restaurants. I am excited to try this cuz it looks pretty simple and something I can handle. Thanks for sharing this on your blog. going to make this tomorrow night for my family, tonight it was the bacon ranch potatoes, chicken breast and garlic brussel sprouts. :D i just love trying new dishes and turning them into family favorites.